SenoraChase January 17, 2018 March 27, 2018 Culture, Let's play! Remember that lame party game Memory, where they would put out a tray with random objects and you would have to remember what was on the tray after it was covered up? That was the inspiration for this game. When I first started teaching, I was given a binder of Art Transparencies, that came with the Realidades textbooks. 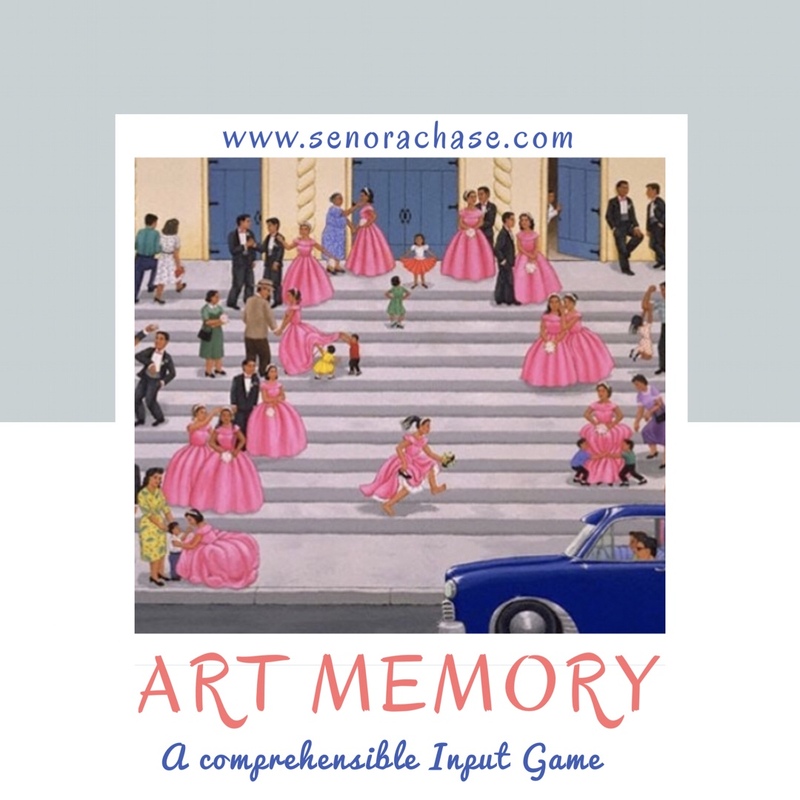 I was determined to chat with my students about the art, in comprehensible Spanish, but I wanted to spice things up so I made up this game. Then remove the image and students take a “quiz” on the details from the picture. Don’t panic, it’s not really a quiz, just a competition to see who remembers the most details about the image. The teacher slowly asks questions about the image and students answer on a sheet of paper. I tell my students to answer in Spanish if they can and in English if they cannot, and to guess if they can’t remember a particular detail. Remember the goal of this (as is everything else in class) is to load them up with comprehensible input, so ask slowly, and repeat each question several times. Ask questions like: what color is …., How many ….. are there? What is the girl doing who is wearing the yellow dress? Ask as many comprehensible questions as you can about the image Here are the questions I ask for Quinceñera, the image linked above. And now, more input! Students trade papers to correct someone else’s. The teacher projects the image again and asks all the questions again, while interacting with the image in comprehensible Spanish (or French or Latin or…) How many girls are in front of the church? Wow! There are a lot of girls in front of the church! Let’s count them! Here’s one, two, three…. Class, there are 14 pretty girls in front of the church! Students think the whole goal of this is to remember the silly little details…. Ba ha ha! Really, they’re hearing a lot of comprehensible Spanish without realizing it. Students award points for correct answers: 2 points if the answer is correct and written in Spanish 1 point if the answer is correct but written in English. After discussing all the questions and asnwers, students write the total at the top and return it to its owner. Here’s how I figure out the winner of every game we play (guess what? More input!) I say to the class “Levántate si tienes 4 puntos o más” (Stand up if you have 4 points or more) Then repeat it with a higher number, stand up if you have 7 points or more. Students with fewer than 7 points sit down. And again repeat “Stand if you have 11 numbers or more” increasing the number each time and decreasing the number of students who are standing. When I have one or two (or three or four…let’s face it, I’m pretty generous when determining the winners!) students left standing, I announce the winners and give them a stamp on their stamp sheet. After Art Memory, you could easily lead into a Picture Talk using the same image, or do a reading about the cultural significance. Or just use it as a way to utilize that gigantic binder of Art Transparencies that you inherited when you started teaching.